Grande Dédale is an elegant Cape Dutch style country retreat in Wellington that offers warm and inviting South African hospitality. 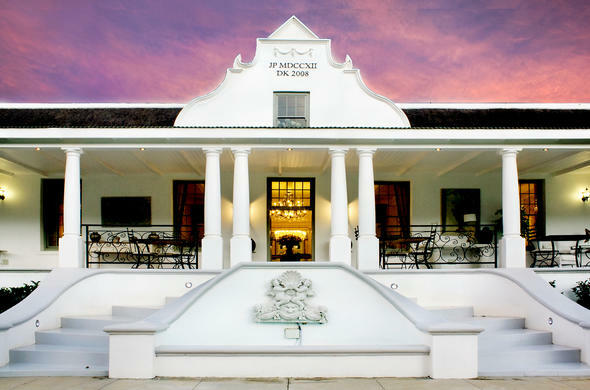 Grand Dédale is situated on the Doolhof Wine estate outside Wellington in the Cape Winelands, at the foot of the Bainskloof Pass. You will enjoy country house living at its best. Grand Dédale has sweeping views over the valley towards the Hawekwa Mountains. This wine estate in Wellington in the Cape Winelands offers comfortable accommodation in six individually designed en-suite rooms as well as a romantic thatched cottage. All of which have wonderful views over the winelands. You can enjoy exploring the region either by mountain bike or in 4x4 vehicles up the Bainskloof pass, or go on hikes up the nearby mountains. Alternatively you can spend a morning horse riding. There are many beautiful wine estates in the area that will allow you to taste fine South African wines. Enjoy a refreshing dip in the pool, or pamper yourself with a treatment in the spa room.